Well, here we are. . . a new blog. This one replaces my OTHER two blogs, however. My oldest one, the Happy Papercrafter, was mostly concerned with paper crafts: cardmaking, scrapbooking, and a (very) little bit of art journaling. The second one, Cut the Scraps!, was mostly for sewing, including dressmaking, patchwork, etc. However, I find myself more and more overlapping these crafts, and I never liked the name "Happy Papercrafter" anyway, so here we are. Last night I attended the "Arty Dolls Workshop" at Artistic Stamper, although it was organised (note the UK spelling) by the Selling Women's Institute. I'm glad I went although at first I wasn't too excited about it. Unfortunately a few people pulled out at the last minute, so I really felt sorry for the workshop leader who had obviously planned for more people. Anyway, this was my first attempt at making the clothespin dolls (or "peg dolls" as they're called here in the UK). The leader brought in some very elaborate bride dolls and others, but also some really, really simple ones. This might be something crafters could do with their children to get them started in crafting. I can see that children might enjoy making these to illustrate and play out a fairy tale. For example, make a dowdy Cinderella, a Cinderella at the ball, a Prince Charming, three ugly stepsisters, and a fairy godmother. They could make a stage from a shoebox and fabric scraps, and even a coach with a smaller box. I saw at least two Rapunzels last night. And there are many examples, patterns, tutorials, etc. on the Internet. I did this one in about 45 minutes with no pattern. I drew the face on with a black marker pen. If I'd been better prepared, I would have taken more care with the detail, but just shows how easy it would be for children to do. These cards are both from a Polish blog here. 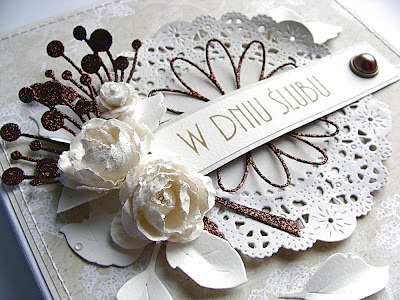 If you want to see some absolutely gorgeous cards, you should have a look -- and chase some of her links to other Polish cardmakers. They're stunning! Again, the 5"x7" card, which is my favourite standard size. I expected the die to basically be just smaller than this card. I'd hardly be able to fit a small sentiment inside it. Oh, well. . . the Make-It Show in Farnborough is coming up in two weeks, so I'll be able to see the dies there before I buy. Maybe. Memory Box do a die similar to what you bought and it's just under 4" tall. Thanks for the info. I'll have to have a look. And thanks for being the very FIRST to leave a comment on my new blog!! That doll is wonderful! I tend to not like buying art supplies unless I can see them either because I feel like it's hit or miss. I think it is a different die on the sample cards. If you look closely at the two...yours has a slightly different pattern. I also think the sample is the memory bob die. I have seen these dolls before, yours turned out so cute. I do all different types of crafts and showcase them on my one blog. I would find it to confusing to have more then one for me, lol. The die you bought looks a tad different then the ones featured on the cards. The ones on the cards have a berry (or circle) on every single branch. That is a very cute doll. Love the doll ...such fun ...great for using up small pieces of material ...and making characters for kids. Shame about your dies ....sizing can be misleading ...and a problem if you use 7x5 ...I tend to make slightly smaller ones. loving your new blog and that doll. What a disappointment about the die(s) though. I bought the Xcut alphabet (like a decorative strip) but it was so disappointing and all the card stuck in the letters and ripped when you tried to poke them out etc. I actually sent it back and got my money back - she didn't ask any questions so I think she knew why I wanted to return it. Anyway, enjoy them 'although small' I understand they cut beautifully. Oh I love your peg doll! What a shame your dies were so disappointing. Hope you find the right one soon. 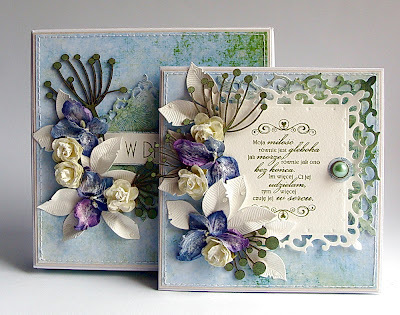 The first card looks like it is made with the Memory Box Chloe stem die. You should find it at Farnborough as it's a very popular die. The Memory Box packaging does not allow for the die to be seen so I always open the pack very carefully to have a look. Several times I've put them back because they are nowhere near as large as I thought they would be. Sorry I can't help with the other card. The Marianne frame is quite a useful die although perhaps not suitable for what you wanted it for. Enjoy Farnborough, I haven't been for a few years now as I find the entrance ticket has priced me out.